Buy CARRERA 97 Ssunglasses online today at a friendly price. Originally made in 2015, CARRERA 97 S sunglasses are lightweight metal frames. They are comfortable to wear and are designed in signature Carrera sunglasses frame style. Each pair of these authentic Carrera sunglasses ships worldwide with a Carrera glasses case and a cleaning cloth. After the order is placed, sunglasses CARRERA 97 S will be packed and shipped to you via fastest shipping method to your location. Please note that when buying eyeglasses online that were manufactured in more than one size, you need to be attentive, especially if you are buying eyeglasses frames for replacement. Prescription lenses from old frames will only fit when the size matches. Size is written on glasses temple or sometimes on inside the nose bridge. Size does not matter if you are buying CARRERA 97 S with prescription lenses. 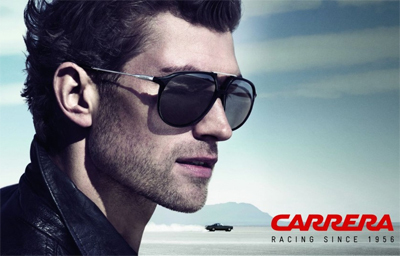 About Manufacturer Carrera glasses and sunglasses are part of Carrera brand. Carrera glasses can be called the very first line of fashion glasses. The very first collection was made for pilots and after becoming very popular, was expanded to ready to wear market. Buy Carrera glasses and sunglasses from EyeInform website to be sure you are getting 100% authentic product. Carrera eyewear style is inspired by sport and free American spirit. Champion, Carrerino Carrera sunglasses models are must have in every man sunglasses collection. Carrera is an Italian brand. Each pair of Carrera eyeglasses undergo rigorous quality control and you can be sure to receive high quality eyeglasses at a very good price. Carrera eyewear is targeted for mass market and therefore they are priced very good as compared to other brand name eyewear. Buy Carrera eyeglasses and sunglasses at EyeInform website for fast delivery and easy returns.